Directions: The street near the Naples Pier are metered so bring some spare change. Once you're parked the beach access leads directly to the pier. Personally I like wooden piers, the age and wear gives them a bit of character. 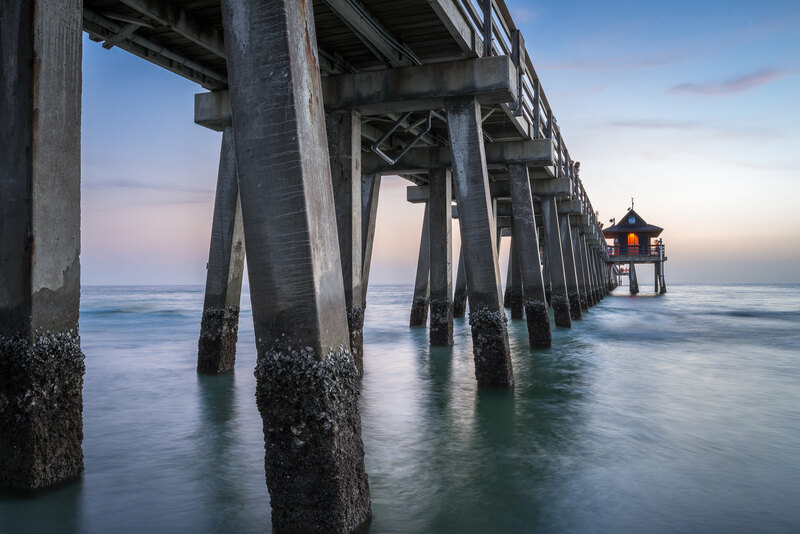 Modern piers are made of concrete and lack personality but the Naples Pier has two things going for it: the structures on the pier give it a nice focal point, and it’s on the gulf coast so it’s a sunset shot, which is a nice change for us east-coast photographers. Naples Beach is very popular and the sunsets are beautiful, so the beach is pretty crowded around this time. You might have to visit a few times, or do a bit of photoshop work to remove random people near the railing. Also, spend some time with an app like The Photographer’s Ephemeris to determine a nice angle for the sunset around the pier. Bring your tripod and plan on some long exposures to calm the surf and make the details of the pier pylons stand out.